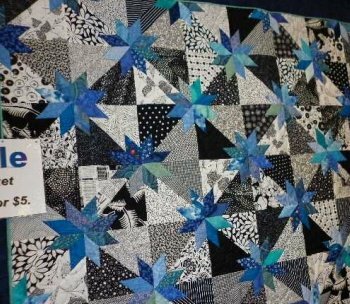 Annalise's Hunters Star quilt was a quilt I made from my quilting stash and scraps. I saw this quilt at a quilt exhibition and loved it. I purchased the template and had fun! I am very pleased with how it turned out. Annalise was so enthusiastic when I gave it to her that she wrapped herself up in it! This Hunter's Star quilt is going on a bunk bed so it sits flat on the top of the bed with no tuckin. For the reverse of the quilt I used a fairy panel and made the border from fabrics strips I didn't use on the front. Annalise, who was 6 when I gave this to her uses the fairy side as the front of the quilt! I knew she would! But as she gets older and grows out of fairies then she can use the pieced star side as the front. I hope she doesn't grow out of purple! Below is a photo of the quilt that caught my attention at the quilt exhibition. You can see that it was the prize for the raffle. I'm sorry that I didn't win it. 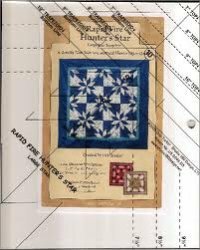 When I purchased the Rapid Fire Hunters Star quilt template on the right it came with very full and easy to follow instructions. I also viewed the following excellent YouTube video by Deb Tucker before beginning this quilt. 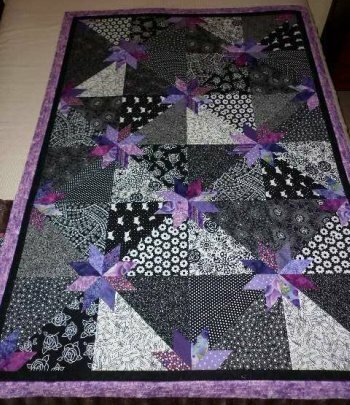 If I was to make this quilt again I would ensure that I used a larger diamond shape so that there was more purple in the quilt. When Annalise is a teenager she will probably prefer less purple and more black, so I may have done OK in the end. For the back of the quilt I used a fairy panel. This was the same fairy panel I used on Emmy's half square triangle quilt as well. I bordered the panel with strips of fabric from the front of the quilt. The width of these strips was determind by the smallest piece of fabric. 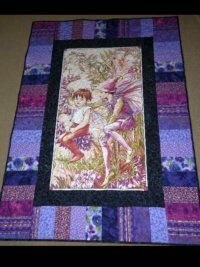 The black sashing was added to enlarge the central fairy block as I didn't have enough purple to make a bigger border. The quilt has been quilted using a large stipple design that looks good on both sides of the quilt. When photographing this quilt I noticed the wonky edge across the top and down the left hand side. This is the result of me not stretching the binding slightly as I sewed it on. I wont do this again, I hope!